This dramatic landscape has been influenced by our ancestors for thousands of years. 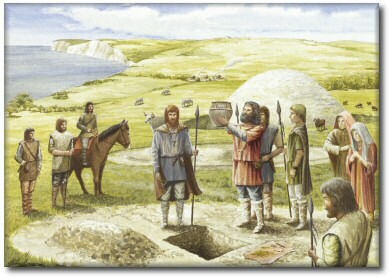 The mounds, or barrows, on Mottistone Down are burial sites that date from the Early Bronze Age, around 4,000 years ago. Bronze Age settlements were on lower ground but on the chalk downlands arable crops were grown in small fields and cattle and sheep grazed. The dead were often cremated and their remains buried in urns as the illustration depicts. Later a ditch was dug and the material used to construct a mound to cover the graves. This urn was removed from the first barrow in 1817. Succeeding generations have continued to use the land for grazing. The third mound, known as the Harborough Barrow, has a long history as part of the national beacon system. It also saw action in World War II as an observation post. Today this is a Site of Special Scientific Interest (SSSI) and the barrows are Scheduled Ancient Monuments. The area is important for its archaeology and for several rare species. Wight Conservation is restoring the landscape. To help maintain the rich biodiversity cattle grazing is a major conservation tool and reflects the way these grasslands were managed by early farmers.